I work with a number of runners who dabble here and there with triathlon — either as a way to make use of all that cross-training they do, or as something fun and different in between marathon training cycles. If you’re looking at giving the triathlon a shot this summer, it’s going to be important that you understand the basics. To help with some ideas, I reached out to George Darden. 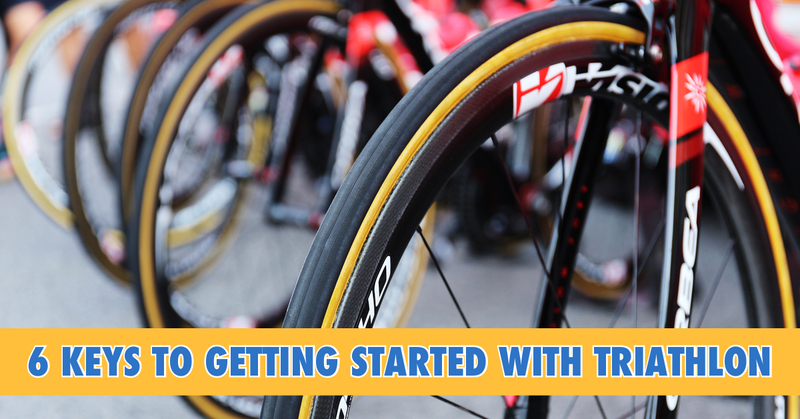 George is a coach with ITL who specializes in coaching triathletes but comes from a running background — making him the perfect person to talk about how to get started in triathlon from a running background. Over the years, I’ve had many runners ask me for advice when trying triathlon. As a runner who moved into triathlon myself, I’m familiar with many of the mistakes that runners-turned-triathletes make. In fact, I made many of them myself. Here are a few things to keep in mind. As a runner, you’ve learned that an easy, conversational pace is best. It is at this pace—which is a minute or two slower than your marathon race pace—where you build the aerobic engine that is most responsible for getting you to the finish line quickly. However, many runners forget this when they start training for triathlons. Because they only do two or three runs a week and two or three bike rides a week, new triathletes think that they need to use their limited time to do hard things. However, if you run hard on Monday, bike hard on Tuesday, run hard on Wednesday again, and then bike hard on Thursday again, you’re setting yourself up for mental and physical breakdown. Just like in running, you need some hard days, but don’t make the mistake of going to the well every day. Instead, limit yourself to two or three hard efforts each week—just as you would if you were solely running—and spend the rest of your time building your endurance with slower paced workouts. In every sport, athletes prefer to do what they are good at doing. As you probably know, a runner who is really good at short, fast workouts will do a lot of short, fast workouts, even if the runner needs to be doing longer, less intense workouts at that point in the training cycle. The same is true in triathlon, but with three sports rather than just one. A triathlete that doesn’t like swimming—and, for a variety of reasons, triathletes who come from running tend to dislike swimming—will find any reason not to go to the pool, even if they need to spend time there refining their stroke and laying down the neuromuscular patterns that will make them more hydrodynamic. Likewise, runners tend to avoid the weight room, and they eschew “transition runs” and “brick runs” in which they go for a [usually uncomfortable] run after riding their bikes. If you avoid these things, though, and only do the things that you enjoy and are good at, you’ll never improve. You have to be willing to spend some time—and it may be A LOT of time—doing the things that you’re not very good at doing. If you’ve run a marathon, then you’ve had to learn to take in calories while running. Most triathlons last at least as long—and sometimes much longer—than a marathon. As a result, you must learn to fuel yourself during the race. There are a variety of options, and research has shown that you can indeed train yourself to be better at processing calories while your heartrate is high. Because this can be messy and uncomfortable, though, many new triathletes put off practicing their nutrition until race day arrives. The results, predictably, can be disastrous, but it’s so common that fueling is often referred to as the “fourth discipline” of triathlon. Treat fueling with the same respect that you treat swimming, cycling, and running, and give it the attention and practice that it requires. Accumulated fatigue is the coin of the realm in all of endurance sports, but this is particularly true in triathlon. In running, it’s normal to strategically carry fatigue from one day to the next and one week to the next before tapering for the big race. This is true in triathlon, as well, and I might argue that it’s even more important given that you never begin a triathlon run on fresh legs. Don’t get discouraged and give up on the whole thing. Just know that continuing on when you feel a little worn out is part of the process. Running is great because it can be very simple. Shorts, shoes, a top, and you’re ready to roll! Triathlon can be a bit less straightforward. To get ready for the bike leg, you have to have a bike, and you have to have a place to ride that bike. And you need a change kit and lube and a pump and a helmet. Swimming? Goggles, swimsuit, cap, pull buoy, paddles, fins, possibly a wetsuit . . . and, oh yeah, a pool. Unfortunately, having to amass all of this gear serves as a barrier to entry for many people, but don’t let it discourage you. Just because you don’t have the latest watch or the sleekest wheels doesn’t mean that you can’t take part in a triathlon. While it’s certainly possible to “buy speed” with high-tech bike frames and swimskins, no one expects you to show up on the starting line of your first triathlon with the most cutting edge gear. Triathlon boasts a healthy diversity of different athletes, and it’s a very welcoming community. People of all shapes, sizes, and athletic abilities compete in triathlons. Sure, there’s lingo and insider information that experienced triathletes use, but the vast majority of athletes at a local triathlon are just like you: they train the best that they can with the gear that they can afford, and they’re just looking for an exhilarating race experience. If you’re still feeling intimidated, sign up with a few friends as a relay team, enter the beginner division, do the duathlon or aquabike option, or choose a women’s only tri. These are all good ways to ease into it.